When we come to KC, we don't have to watch television with y'all, right? FIRST, the greatest thing about being a teenager in Wyandotte County from about 1984 to 1987 was the fact that Homeland Security hadn’t been invented yet. Looking back, the culture was a lot like “the yard” in a prison movie. I attended an arts and science magnet school, and for MY school I was the worst of the worst type of punk. At a REAL ‘dotte high school...not so much. So I surrounded myself with a tightly knit crew...made up primarily of ex-pats from deep in the hills of Virginia, as well as various childhood friends who did not make the magnet school cut. The roughest possible trade. Nightmarishly stupid. And we had many adventures. These were the days of heavy metal, where your credibility was measured by the tour t-shirt that you wore (and if you were not actually AT that concert, there was nothing to save you from a swift and brutal punishment). There were guys whose uniforms were simply NO shirt, jeans, and motorcycle boots. They were not to be trifled with. You wouldn’t even TRY calling “shotgun” before getting into a car with them. I was an Ozzy guy...Ronnie James Dio...Iron Maiden put on a good show...Metallica was still a rock band back then...and my preferred method of transportation was my best friend’s yellow 1970 Camaro with all of the hot rod stuff packed in it vs. my 1974 Ford LTD (with a stereo worth twice as much as the car). The introduction of a CAR into a young man’s life has great significance in relation to food. Up to that point, you were at the mercy of an adult when it came to dining out. My family ate out a lot, and for the tiny speck of the country we had at our disposal, we managed to try enough foods to set the stage for my lifelong search for great meals. As for me and MY crew...fast food dollar menus had not been invented yet, so on a weekend you’d find us cruising Peter’s Drive-in, getting carryout from Taco Kid, eating horrible concession stand food at State Drive-in...we didn’t have part-time jobs like a lot of the SUCKERS we went to school with, but we were as industrious as the Vikings. And what plunder would we enjoy??? What food was so iconic that we’d even get a “oh man, that looks good” out of the shirtless guys, who would then respect our choice enough to NOT just knock us down and steal it from us? 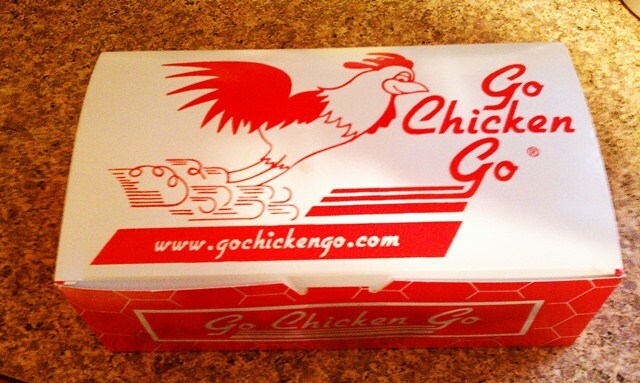 Though it predates the custom, it was the equivalent of a rap artist “makin’ it rain” when you popped the lid on that beautiful red and white box from......GO CHICKEN GO! GO CHICKEN! GO CHICKEN! GO CHICKEN! GO CHICKEN! GO CHICKEN! Before I left work today I was trying to decide which of the four (?) locations would be the most convenient. Instead of looking at it THAT way I figured, what the heck...go to original location back in the 'dotte. No sense in being inauthentic this late in the week. 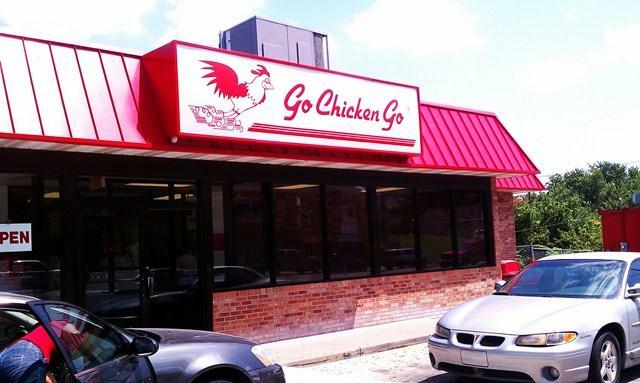 If I recall my website research correctly, Go Chicken Go originally opened in 1969 and moved to the 7th Street location in KCK in 1973. When all of us young toughs were eating there, it was still in an old gas station. They've upgraded it quite a bit, but at least they didn't go and put in a drive-thru like all of the other locations. It forces you to get out of the car in a bad neighborhood! Not really too bad. These days the army convoys run interference for the hipsters crossing the river to bring in all of their remodeling gear. 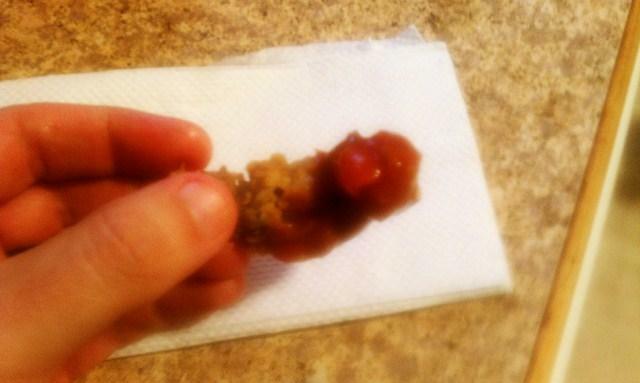 I’ve only eaten the chicken a few times in my life and it’s okay, the livers are excellent, but I cannot count the number of people throughout my life who first said “Oh, GROSS!”, and then after one bite said something like “I am literally going to name my first child Gizzard”. They really are the best in the world. THE WORLD! 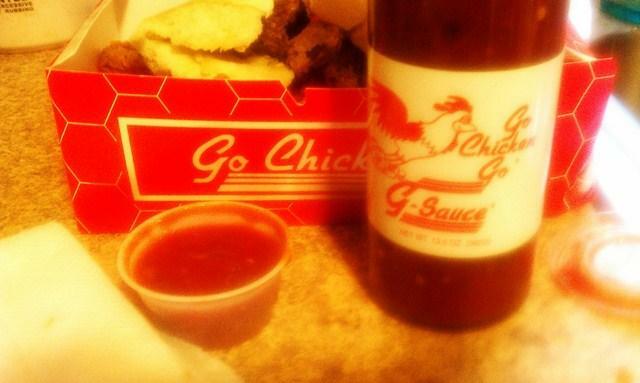 And their G-Sauce...oh my dear lord it is the perfect addition to those crispy and tender (gizzardly-speaking) morsels. I don't know how they make them so tender, and if you ever ask you are either talking to someone who gives you the finger for being dumb enough to ask or they just go "whuh?". Now, I know that a primer on midwestern liver and gizzard etiquette will never be as interesting or involved as the Babylonian Talmud OR discussions about "chopstick or finger usage" in relation to sushi eating....BUT after a lifetime of doing this I can tell you there is a certain protocol. 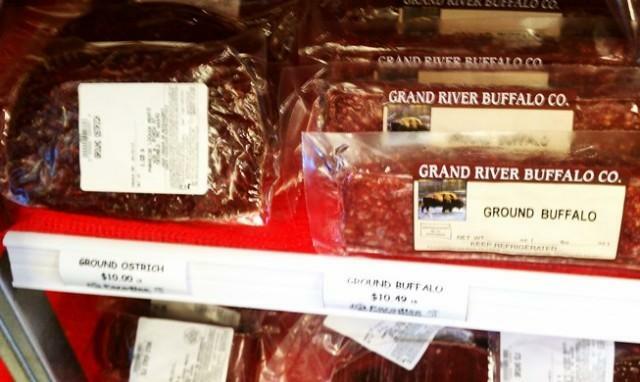 The following is for a liver/gizzard combo...the rules can vary slightly if it's a single-source order. First, when you pop open the box, if the little packet of salt hasn't soaked through with fryer grease yet, get all of that sprinkled on there. You'll be tempted to just start chowing down, but you have to do a couple of things first. 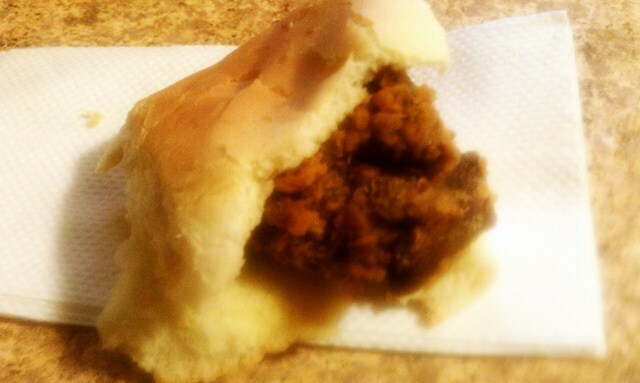 Grab a liver first, and a roll. Make a little sandwich. Burn that sucker down. 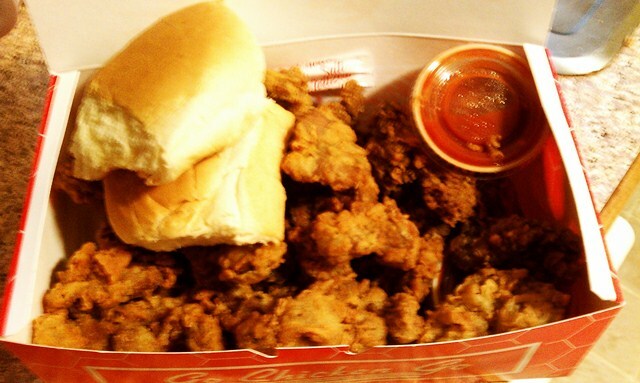 That initial hit to the system will relieve the anticipation, then you pick out a gizzard and dip it in the G-Sauce. Speaking of the G-Sauce, I always try to have a bottle in the house. Unlke most BBQ sauces, it has a ton of applications. The flavor and texture is kind of like a medium-hot salsa combined with cocktail sauce and several tears harvested from grown men who are paid to sit in the back of a Go Chicken Go and watch "Brian's Song". I don't even remember the last time I was down at the original spot, it was nice to get back down there. If it weren't 100 degrees, I would have done some impromptu stops at a few places....there's a great restaurant supply store just a couple of blocks from where I was, and 7th Street intersects two of the best avenues for Mexican food in the 'dotte. Oh man, it is getting late. I always do this too. Up late, then up early. Nothing too groundbreaking tomorrow, but it's my biggest and most favorite ritual of the entire week. If you guessed that I just sit here all day watching a constant loop of "Extreme Chefs" on Food Network, you really have gotten to know me this week. Ohhhhhhhhhhh, you have GOT to love "Go Chicken Go" ! Especially the logo...the chicken with the Road Runner-esque dust clouds spewing up from his feets. THAT is classic ! And, *my* first car was a '73 Plymouth Duster.... *It* didn't have a stereo....you must've been uptown ! I've always questioned your taste in entertainment but puhleez tell me you don't really watch Extreme Chefs!?! Jim's, RedX, the 'dotte and all of the other under-belly glimpses into our fair city I could handle but that is just embarrassing! Shelby- My favortes would be Jersey, OC and then Atlanta. The Jersey folks know how to eat. I've been pretty good about keeping this train on the tracks, and I DO have an actual food-related thought about the housewives/reality phenomenon. It kind of de-mythologizes what I think of as "rich" people when folks who are so status and high end brand name obsessed go out to eat. Mystified by things like simple salmon tartare, or turning up their noses at something new to them in lieu of spinach artichoke dip at their local chain. I just sit there thinking, man, if I had THAT kind of money I'd have Thomas Keller and David Chang on my speed dial, lol! 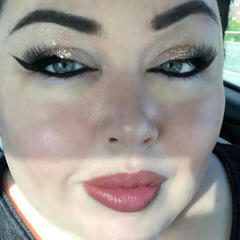 Kim- It hurts my feelings that you wouldn't rather watch a Millionare Matchmaker marathon with us instead of going to eat at El Comedor. Pierogi- Sixteen year old criminals get to take their pick of the finer things, lol. 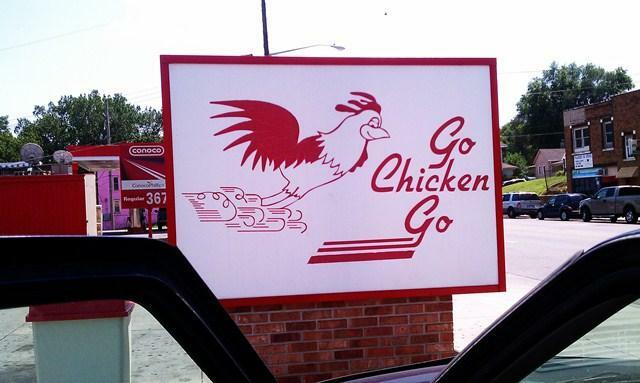 The Go Chicken Go logo is so ingrained that it's funny to get a reaction from someone seeing it for the first time. It is iconic, almost tattoo-worthy. Judy- I absolutely don't watch Extreme Chefs, bad mistake to even joke about such a thing. This is a Chopped household, we'll go that far with Food Network. The latest Rocco trainwreck can be entertaining...you can watch him try to fine tune his persona from episode to episode in an attempt to be watchable. Saturday morning is a big deal for me. Getting up at dawn on a morning I don't really have to is kind of an inside joke. The ritual is followed to the letter, and going to sleep on Friday night knowing it's coming is a great feeling. About once every six weeks or so when the weather is nice I'll switch it up and play golf, but Sunday is golf day for the most part. As much as I love playing, I don't like to interfere with the plan very often. 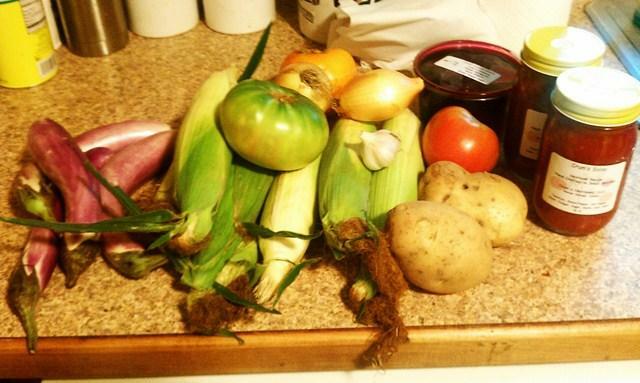 With the bounty of corn and tomatoes right now, market season is reaching its zenith. 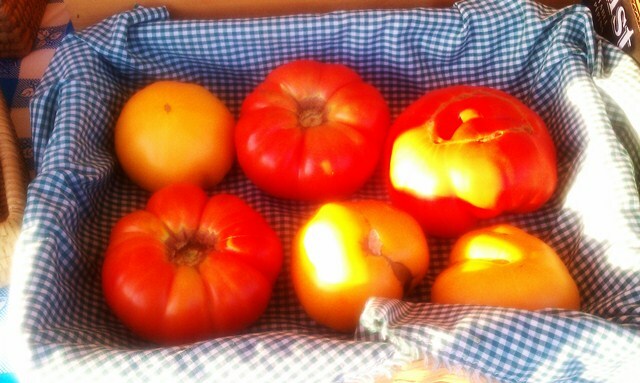 I'm very loyal to my local farmer's market here in Parkville. It's small but it has everything I need, you get to know the farmers pretty quickly, and it's about three minutes from my house. Right now it's about ninety seconds from my house due to all of the flooding in downtown Parkville. They had to relocate to a parking lot by the City Hall, but at least they have a good spot to use until the flood waters subside. 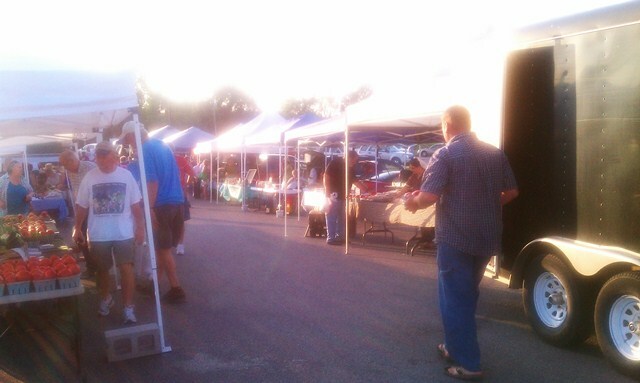 7am is the "official" time the market opens on Saturday, but only the real amateurs wait until then to get down there. The best stuff sells out fast and by 7:30 it's way too busy to hang out and chat with the farmers. This year is the first that we've ever belonged to a CSA. 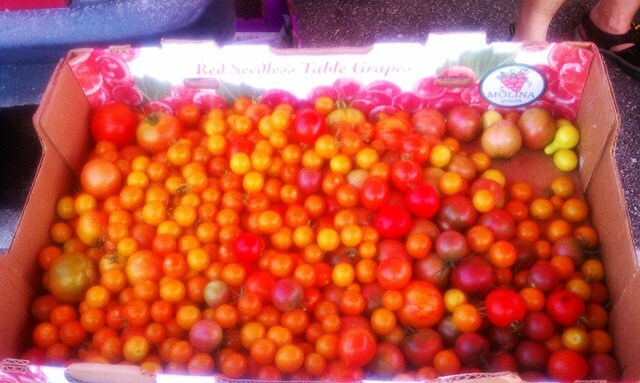 Crum's Heirlooms is very, very popular among locals and they supply a large number of our best restaurants. I'm thrilled they've chose Parkville to set up shop on a Saturday morning, so knowing I have a big bag full of great stuff waiting for me when I arrive is over the top. Just a few photos....this was the first Saturday that the Crum's tomato supply was BOOMIN', so this was the day I've been thinking about since last October. 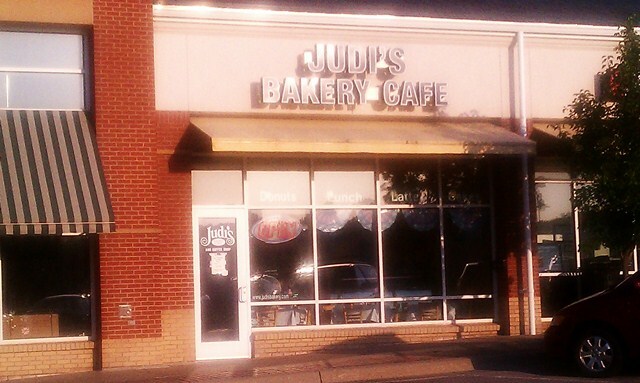 The Parkville location is pretty new, but I grew up eating Judi's donuts over in the old neighborhood and went to high school with her daughter. 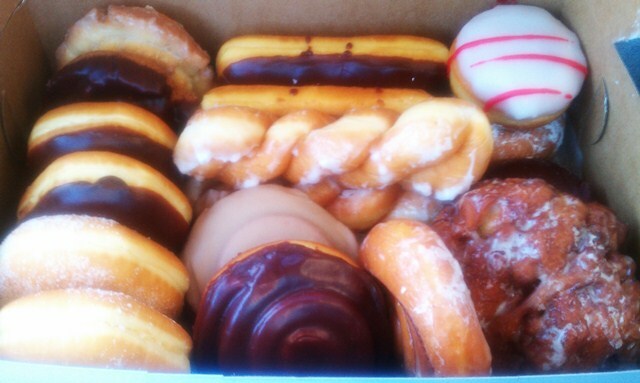 I'm not saying they have the very best donuts in Kansas City, but they might have the best danish in the midwest. Their glazed croissant "French donuts" are pretty killer too. Every single Saturday I'm in town and not out on the links, I pick up six rings and a dozen large, then I go and share them with some friends of mine...hanging out, chatting, chowing down on pastry and drinking coffee. It all sounds pretty basic, and it is. But basic is good. Market, donuts, go hang out, and then go see what the rest of the weekend has to offer. Here's what I picked up at the market this week...our CSA plus a few extra things like Crum's pickled beets and salsa. Almost forgot, I was back over by Red-X and I took a picture of one of those weird front window displays. This kind of thing stretches all the way down the front of the building facing the street. Once the mandatory Saturday fun is done, and I don't need to stop by the barber, one of my favorite things to do is visit my butcher. 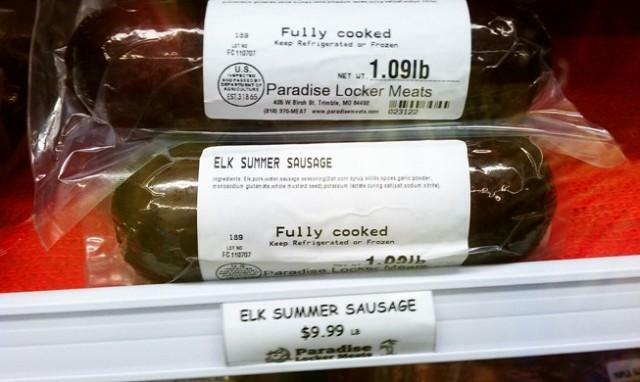 We are really trying to stay away from the megamart factory farmed stuff and use Paradise Locker Meats as our sole supplier, so I try to head up there about twice per month. 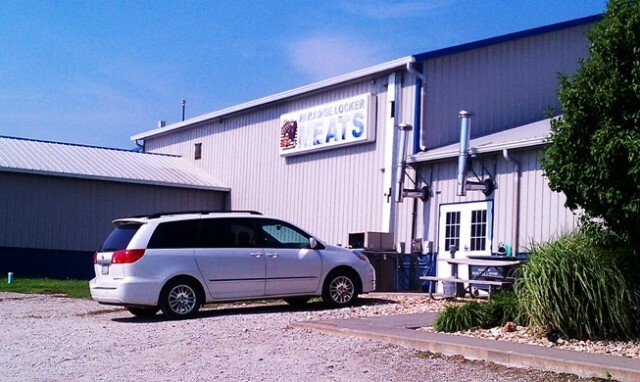 It is up in Trimble, north of Smithville, and you would never guess that this unassuming little building is where much of the meat we eat in restaurants like The Rieger, Lidia's or Port Fonda originates. The Fantasma's are doing great things up in Trimble. As you may recall they were my dinner guests last Saturday night in the Airstream. Great folks. 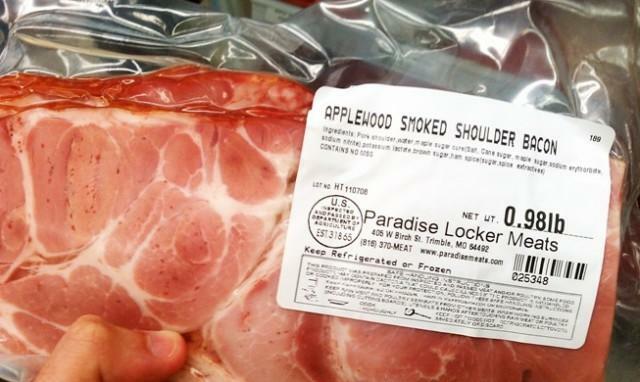 When you go into Paradise Locker, you are experiencing what a true butchershop should be....incredible selection and a knowledgeable, friendly staff. 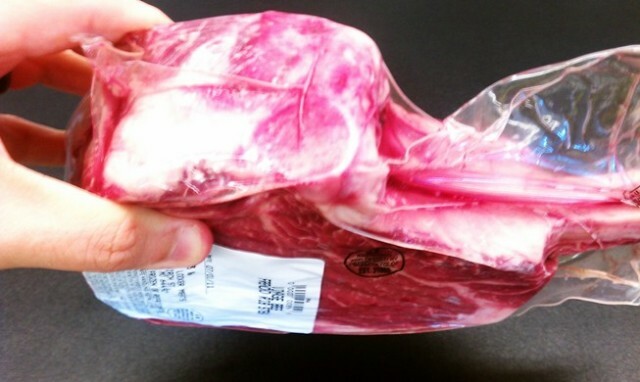 If you have any question about any of the meat....origins, recipe ideas, how they process everything there onsite...buckle up for one fun and informative conversation. Trimble is about twenty five minutes from my house......Paradise locker is in the COUNTRY! 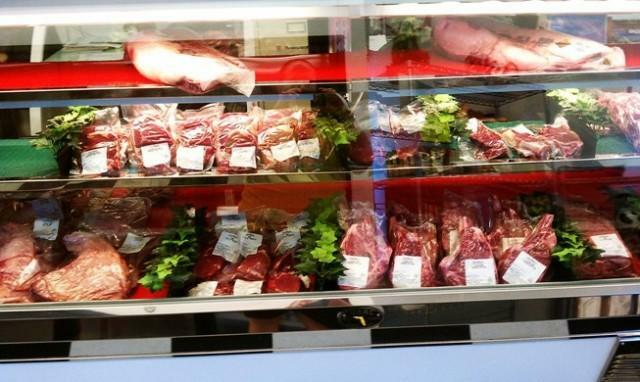 Here's the fresh case....much of their selection is processed and then immediately frozen. Lots of different animals and products....but stuff does not hang around long. The selection constantly changes. One of my favorite things happens to match up very well with the the abundance of tomatoes, their pork shoulder bacon makes the ultimate BLT. If you want fancy, you got it.....when they have Wagyu flatiron available I usually pick up some of that, same with their Akaushi hamburger. 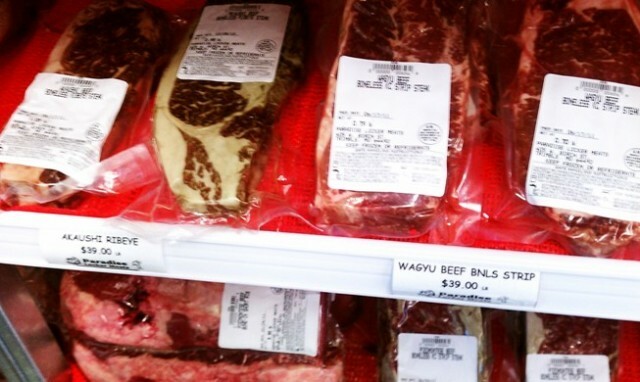 I don't think I've ever bought a Wagyu or Akaushi ribeye or strip for myself, usually only as gifts. Cost aside, David Chang's ghetto sous vide technique (and now my SVS) guarantees that you can transform a less glamorous cut of beef. I'll pull the trigger one of these days though.....gotta happen. 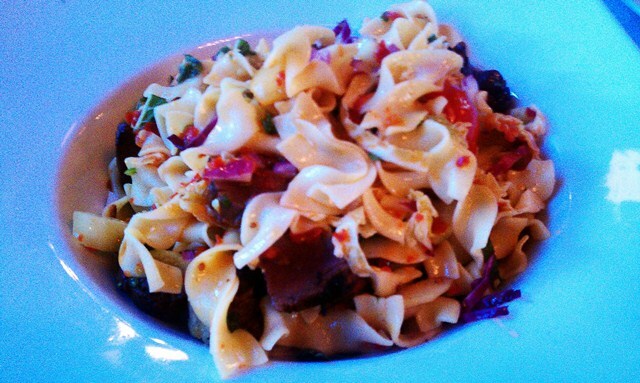 We've got dinner in the Crossroads District again tonight. For his birthday, my dad picked Grunauer. 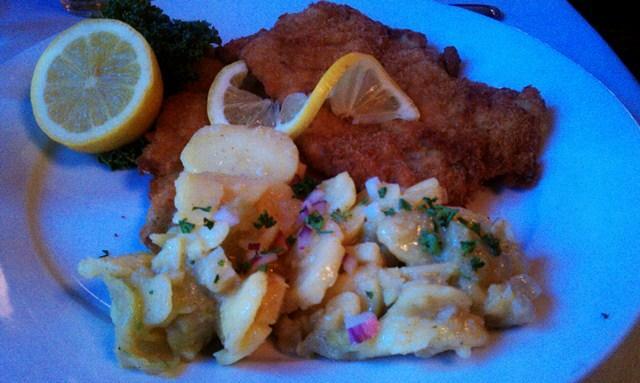 German or Austrian food would not normally be my first pick, but I was very surprised how good the food and service was when I finally got around to visiting. There are six of us going, so it's a major opportunity for photos. Would I have chosen to highlight Grunauer this week if it were up to me? Probably not. Am I as thankful as any human can possibly be that my dad doesn't want a birthday dinner at Outback or Olive Garden??? Big win. Oh man, here is an impromptu little surprise....here's a place that was on my to-do list but I didn't think there would be time to get to it. Plus it's just scandalously unhealthy. And when I asked my wife to stop by there on her way home from the mechanic's, I didn't think she'd take me seriously. In-A-Tub has been around for a long time, but I think there are only 2 locations now. They have loose meat style sandwiches, but the majority of their menu is a selection of deep fried wonderment. Including...their tacos. Just magical stuff, but it's the kind of food you cannot let yourself have more than once or twice per year. The guilt and damage to your body would be overwhelming. The thinnest possible tortilla filled with taco meat (you can add cheese and /or beans, but plain is best), folded shut and deep fried until crispy, then pulled out of the fryer and topped with a few shreds of lettuce, BUT the key ingredient that holds the whole thing together is the neon orange powdered cheese they sprinkle on the top. It soaks up some of the grease and forms a kind of edible glue that keeps the taco from getting too fragile as you eat. You cannot let them sit around or cool off too much because they'll just fall apart, and as they cool, the reality of just how much grease you're eating becomes more obvious and ruins the fun. And they are really small, so you're tempted to just keep eating them. A nice, healthy snack to tide us over before we go have German food! Oh, and Port Fonda just posted on Twitter that they've got those tongue and hominy tacos on the menu tonight...they sit right across the street from where we're having dinner.....this day is apocalyptic healthwise. You're going to make a Viennese sandwich between two slices of (from-the-ridiculous-to-the-sublime) tacos? Just now, he's watching Best Little Whorehouse on TV and we've been remembering the night we saw it at the Music Hall. One of my other favorite KC memories is of seeing the full-length production of Nicholas Nickleby at UMKC. I was a little concerned about spending 8 full hours in a theatre seat. But, it was magical! I don't remember where we ate on either of those trips. I'm thinking the Savoy Grill was probably involved in one of them... You were still in high school at that point and the Savoy was actually good. I'm thinking these days, probably not so much. You know, when you put it THAT way, you make it sound so.....so.......FANTASTIC! Funny you mention it, I've had several conversations about the Savoy lately. I haven't been there in about ten years,and at that point it was pretty hit or miss, BUT I did have the best steak of my life there one night. From what people say these days, stick to the basics and you'll be okay. What a beautiful place too, it needs to stay around for another hundred years! Yeah, it's been a while for us but I think, if you go 'old school' (which in our case means a caesar and steak au poivre) you can still enjoy the glory days. And I also had a good bowl of chowder there at lunch more recently. Based on my personal experience - avoid lobster like the plague! Tonight we went to dinner at Grunauer, Chef Peter Grunauer's namesake restaurant in the freight house building in between Lidia's and Jack Stack BBQ, down in the Crossroads District. I don't know a whole lot about German, Austrian, or more specifically, Viennese food...or if lumping them together like that could potentially offend a large number of people. I don't have a huge emotional connection to the food, but it is a gorgeous restaurant, the service is extremely professional, and anything I've ever eaten there has been delicious. I have zero complaints, and I don't want anyone to think that because I don't have the same enthusiasm for Grunauer as I do for a little cardboard box full of fried gizzards that you shouldn't go and give the place a try. It was dad's birthday, and since we all just ate at The Rieger two nights ago I didn't want to push my luck throwing out other options. I'm lucky not to have anyone in my family who presses for Applebee's or Olive Garden for birthday outings, but if that were the case, Grunauer would be a very good compromise because the quality is more than high enough to satisfy a real food lover, but it's also meat-and-potato based enough for anyone to find something they'd like. Monster portions too...if that is a selling point. I took a few photos, but some things just didn't translate well enough to include and some of us ordered the same dishes. This was my first time trying this dish, and I got it in an attempt to "eat a little lighter" so that I could hit the Port Fonda trailer later. 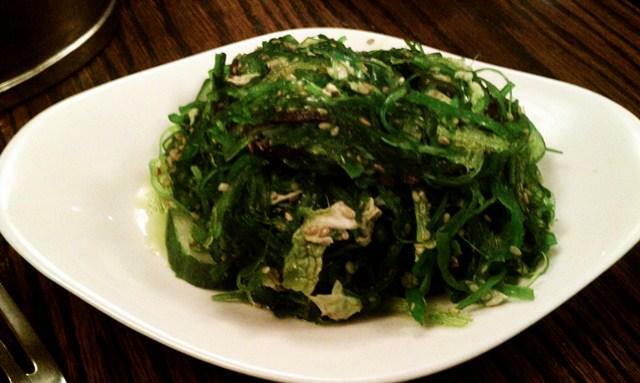 Well, not a light salad. Delicious. Just damn hearty. Oh, way spicier dressing than I was expecting, which is a good thing. My wife's meal- pretty perfectly done and everyone went crazy for the warm potato salad. 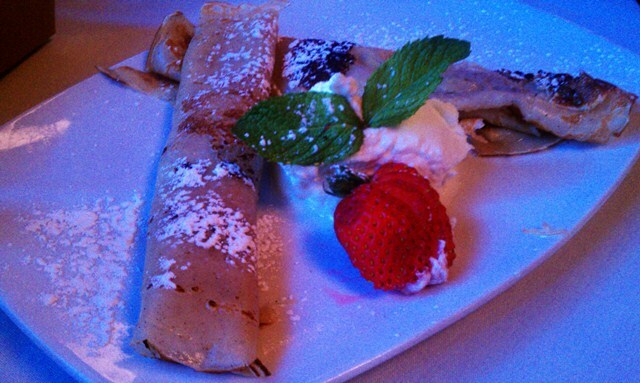 We tried this and the cheese strudel, both very good, not overly sweet and again, enough for two people. 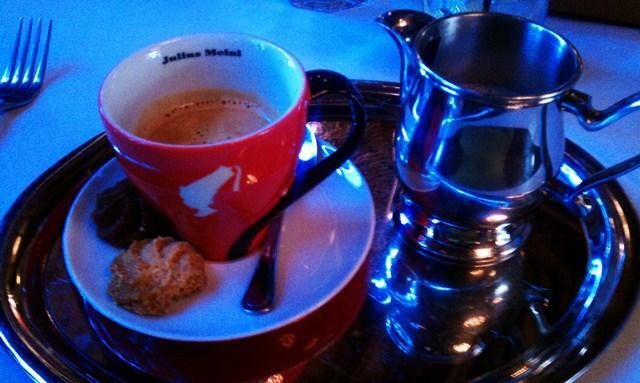 I probably talk about the espresso at Grunauer more than anything else. It's the best I've ever had, hands down. The bitterness is something that hits the spot with me. Makes me contemplate buying an espresso machine, but one more kitchen toy may take my kitchen well past the point of saturation. 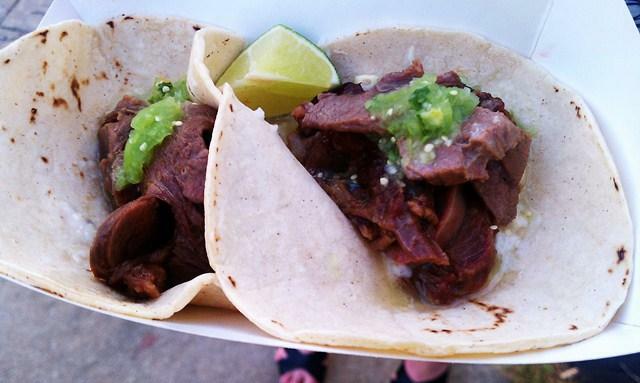 Honestly, I think the main problem tonight wasn't that I'm not excited about the food at Grunauer, it was the fact that I knew lengua tacos would be served two blocks away beginning at 7:30. 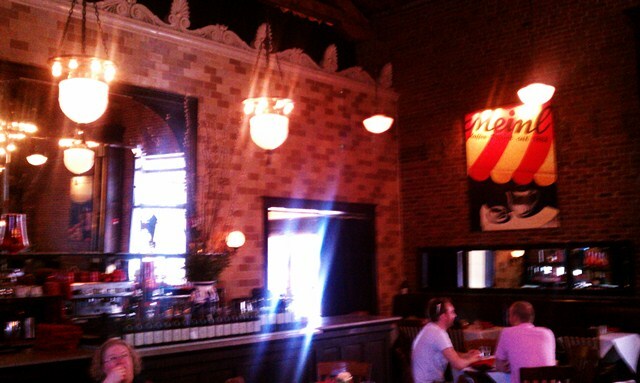 We had some time to kill between Grunauer and tacos, so went over to sit at the bar at The Rieger. No such thing as too much Rieger Kola. Lengua, beer braised Rancho Gordo hominy, fresh corn kernels and chile verde....I have tried every version of this dish I've been able to find in KC and so far these are way, way, way better than anything I've eaten thus far. Oooh, apologies, Zeemanb! I'd forgotten about that whole hemisphere thing and started my foodblog too early..sorry! Very poor form on my part. As they say, it's Sunday SOMEWHERE, so I say go for it! It will help to take any pressure off of me as I try to eek a couple final posts out of my brain, lol. Looking forward to your blog! 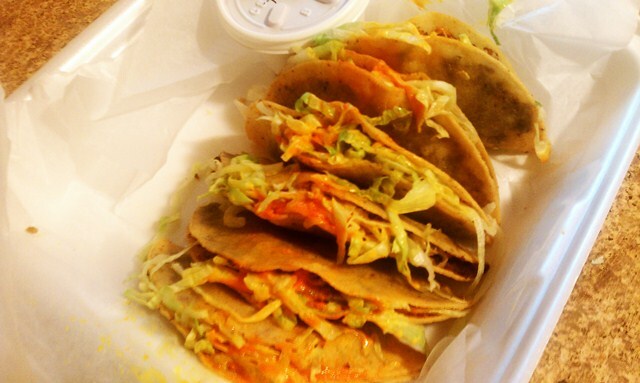 OMG those tacos look incredible! Thanks for all your hard work and amazing writing this week. I really enjoyed it! And after reading about your meals today I don't feel so bad for having food carts for dinner and Voodoo Donut (of maple bacon bar fame) for dessert! Oh, go ahead, buy one. 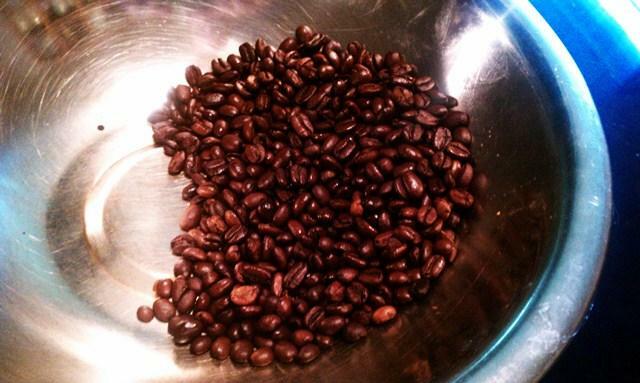 It'll look really nice next to your Sous Vide Supreme, and you're already roasting your own beans. Think of it as a gift to yourself for the great job you did on the blog this past week. I've really enjoyed this, too! I suddenly want to drive for 5 hours to Go Chicken Go! 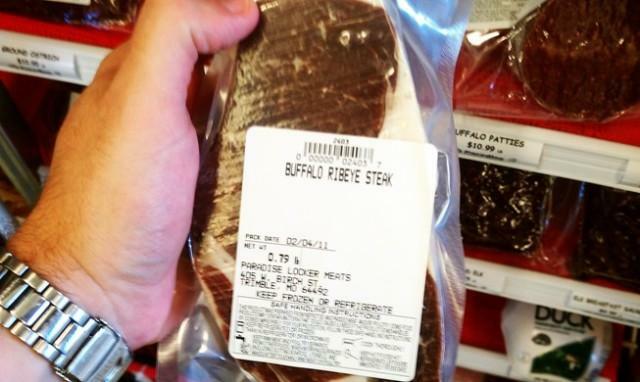 I'm confused...doesn't ox = beef? Isn't an ox a working cow? Thanks for the kind words folks, it will be nice to be back to a "normal" level of food obsession in the morning. And weinoo, the only thing saving me from an espresso machine purchase right now is counter space...so after we take out a wall and expand the kitchen this fall, I will have my list of excuses onhand for when my wife begins with the quizzical looks. 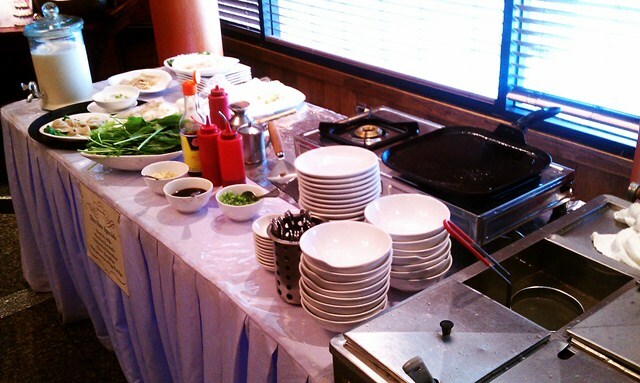 Leaving in a few minutes for OUR version of brunch, dim sum! I'll go ahead and share my plan for a proper farewell to the week just so I don't chicken out or get lazy...I'm giving the duck breast roulade with morel sauce and creamed corn from the French Laundry Cookbook a shot. I've never cooked duck before, believe it or not, so win big or lose big. The good news- it's about twenty degrees cooler today and there's no reason to hide out all day on a Sunday. When Meredith and I think of "brunch", it's rarely of the omelette or panini variety. We generally go with Vietnamese or dim sum. Dim sum is something I've apparently never been able to eat correctly during my travels....there's always some BETTER place I didn't hear about that is a magical wonderland that everyone but me knows about. And even if you DO go to the right place you weren't in the right city....the best dim sum in San Francisco doesn't compare to the worst Vancouver has to offer...etc, etc. I like the crazy big rooms and cart service, so I'll end up somewhere like Golden Unicorn in NYC or Y Ben House in San Francisco. I know I don't approach it as wisely as I could, but I usually have a blast. At 7am on a Sunday morning, sitting solo at a table in Y Ben House with nine Chinese senior citizens, watching them literally run and attack the carts as they come out of the kitchen tends to make up for whatever magic I'm missing flavorwise elsewhere. 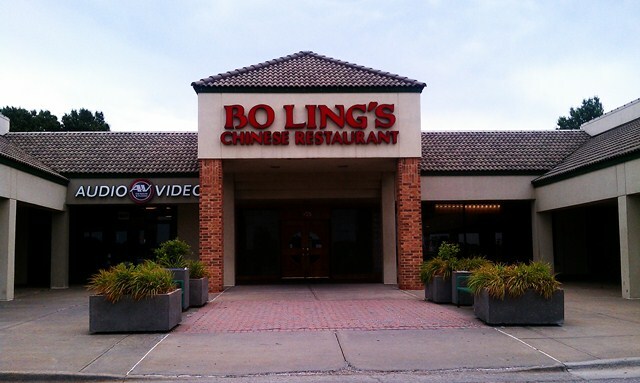 I say all of that to say- the Ng family, owners of the multiple Bo Ling's locations around KC do dim sum that is at least as good, if not better, than what I've had in my travels. 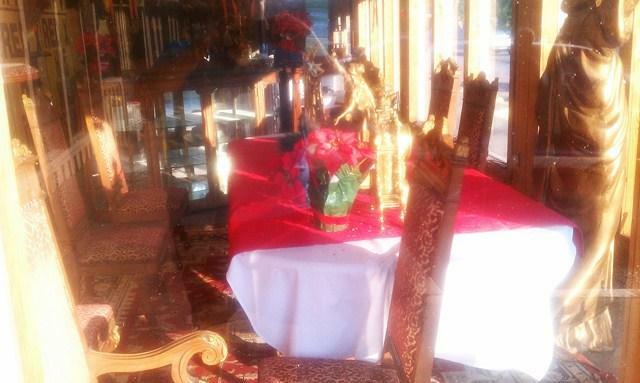 A beautiful space, boomin' cart service, large selection, and from 11am to 2pm on weekends the place is totally packed. The absence of soup dumplings is strange, I will say that. We've been there enough times now to kind of narrow it down to the bare necessities.....it's very easy to overdo it. We'll always try one new thing, but the rest of our meal is made up of tried and tested favorites. 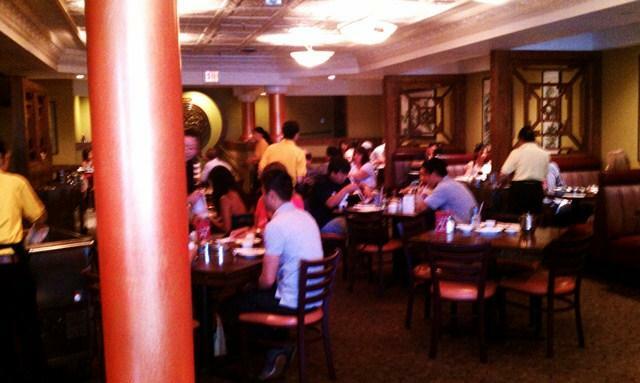 If you are new to dim sum, we're excellent dining companions for your maiden voyage. Pan Fried Fun Rolls- our over the top favorite thing at Bo Ling's...outside the texture is almost like crisp pork belly, then the inside is all soft noodle, topped with a sweet and savory hoisin type of sauce and sesame seeds.....it is best when it is still burning your mouth. Totally worth it. I'm sure by now I've shown that tradition, loyalty and nostalgia are very important themes for me in dining and in life. In order for me to love food there has to be a connection to it that goes way beyond flavor, and I know that most people in this online community can appreciate that because we all share it to some degree. Dim sum is delicious. One of my favorite chowdown foods on earth, but it's also iconic. Specifically, these stupid sesame balls. 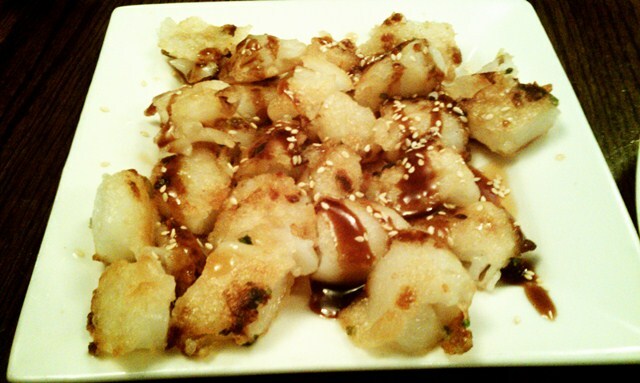 I like them okay when they are sizzling hot out of the fryer, but the reason I get them every-single-time I dine goes back to my first experience with dim sum....1989 in New York City, eating in a dim sum parlor I cannot recall the name of, dining with my late brother. That trip is a very long story, but the short version is- I was twenty, he was fifteen and after visiting NYC for the first time when I was staying with a friend of mine at Yale the year prior, I thought it would be cool if we saved money from our part time jobs and I took him out there. We planned our trip by consulting....Fodor's. Went all out and stayed at the Waldorf, ate at Carnegie Deli a ton, Benihana, saw Cats AND we saw Phantom of the Opera when it was still THE show. We had to purchase scalped tickets with the money that was going towards a meal at Tavern on the Green. It is hilarious to look back on the dining and cultural choices, but hey, two kids from Kansas in the late 80's....whaddaya want? We were blown away by that town, I'm still blown away by it after two more decades and god knows how many trips out there. It's my favorite place in the world. The dream life would be to live there and write about the culture through my unique filter, but I have no interest in doing it poor. 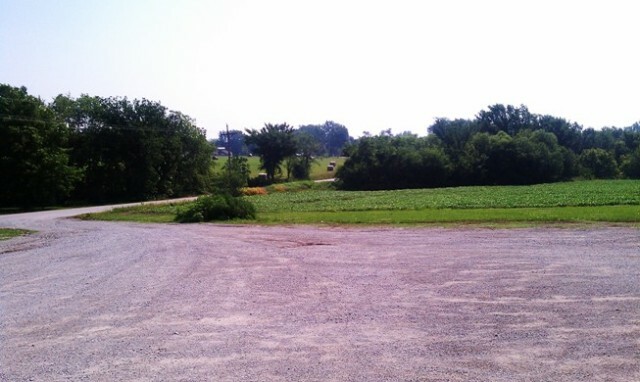 The good life is practically free here in the midwest compared to that place. 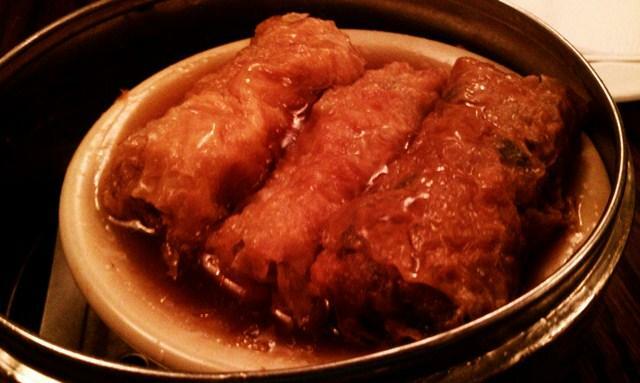 I can't remember how we even heard about dim sum, but our Fodor's guide told us where we should give it a try. In Kansas and Missouri we have a lot of space, and we appreciate our personal space very much. 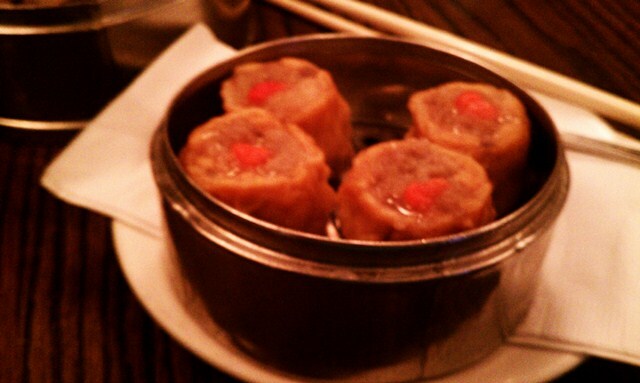 Getting buddied up with two total strangers at a table for four in the dim sum restaurant kind of blew our minds. We sat with these two ladies, and there is a specific word I know but I'm not sure if it's a derogatory Yiddish term or not, so I'll just say.....they were really, really super loud, gossipy, TMI to nth degree, Fran Drescher-y bombastically invasive of your personal space women. And we sat talking quietly to one another in our bad sportcoats, choosing from an array of exotic dishes as the shockwave from their conversation exfoliated us. 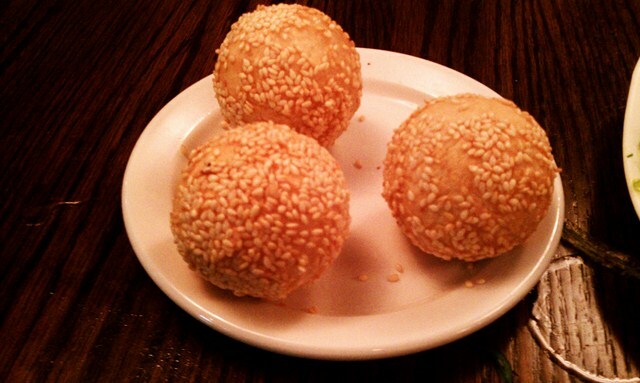 The sesame balls are the only things I remember from that first dim sum experience. I don't think they are ever GREAT, but these were bad....cold and the sweet bean paste in the middle had set up and gotten crumbly. We just looked at each other like "are these SUPPOSED to be like this?". When I go out to NYC, the first place I ever eat, and there is literally no scenario on earth other than the place burning down that would EVER change this, is the Carnegie Deli. I am aware of deli beyond Carnegie, but it's total tradition stemming from that trip. 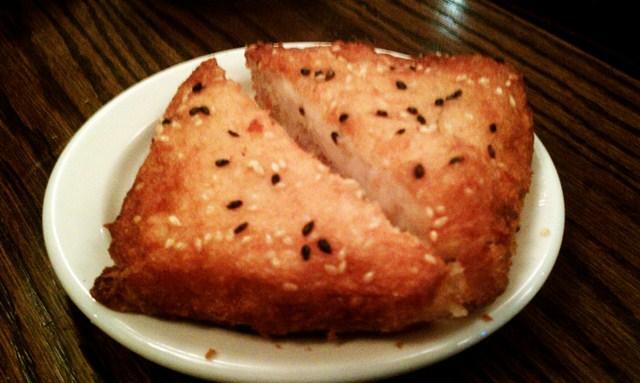 Likewise, whenever I eat dim sum I always, always, always order sesame balls for dessert. We lost my brother later that year, and so it's just something that I do because it's funny to think back to that morning in the dim sum parlor. And I have the type of mind where a sesame ball can be a touchstone to remind me that I've packed in a hell of a lot of life since the first time I choked one down. When it comes to the food I love and I want to share with others, it always has to fit some sort of narrative...a contender that may end up being a major sense memory. Thanks so much for sharing with us. I enjoyed it very much. Oh, Jerry, I really must figure out how to factor KC into some trip back to Missouri! Your dim sum post is wonderful. Many years ago (maybe just after you graduated high school) I spent 6 weeks in Hong Kong for work. (Not a fun thing for a Western woman alone in the heavily Chinese part of that city, especially since it was exactly one year after the Tiannmen Square massacre.) Anyway.. I got to experience all sorts of dim sum, from the Westernized hotel versions to a wonderful Saturday morning in Aberdeen with an Aussie guy fluent in Cantonese. The Aberdeen place was a literal dim sum HALL, full of big round tables, populated by old Chinese guys who had brought their birds with them. The walls were full of cages hung on big hooks! My Aussie friend dealt with grabbing stuff off the carts and arguing with the cart ladies. I just ate and ate and ate! 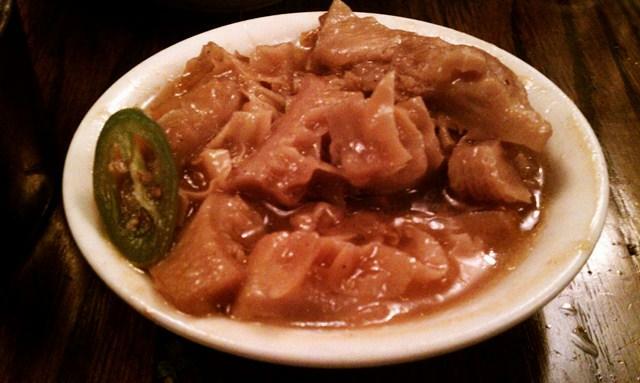 I'd love to experience KC dim sum with you!